Gumby and Beady want to have a family. But, they are brother and sister. I have to take their eggs away so they don’t hatch. I hate to do it, in fact I make my hubby do it for me. A couple of years ago when she was first laying eggs, we happened to have jellybeans in the house. I noticed at that time that they were the same size as Gumby’s eggs. As an experiment, I switched her eggs with the jellybeans. She did not even notice. She just kept sitting on them. So, we’ve been using this system ever since. If you take the eggs away, birds will just keep laying eggs and their little bodies get wore out. You have to put in a replacement in order for them to stop mating. There are (expensive) fake parakeet eggs that you can buy online, but white jellybeans always work for Gumby. She sits on them for a few weeks. When she stops sitting on them, I take out the jellybeans, and things go back to normal. Gumby only lays eggs when she and Beady are alone in a house, rather than with the other parakeets, like they usually are. They have only been alone in a cage for the last two weeks, but they did not waste any time trying to start a family! They don’t have a nest – she just kicks all the food out of her bowl and sits in it. So, last night my hubby took out her eggs, and I put three jellybeans in her food bowl. She looks very happy and content. I have seven parakeets. Once in a while, they have tiffs, and they fight. As a Pet Mom, I have to make sure that all of my pets are safe. For the last couple of weeks, I’ve seen several of my parakeets having fights, but I never could tell who was the instigator. Parakeets are cute and little, but they are strong fighters. I catch them on the bottom of their house (“cage” sounds so mean) clamped onto each other with beaks and claws, rolling around all over the place. Then, I have to reach in, pry them apart, and put one in another house. Over the years since I’ve had birds (parrots, cockatiels, lovebirds, also) I’ve had to keep certain birds apart for various reasons. I don’t like anybody having to be alone in a house, and I always end up with a roommate for whoever is starting the fights. This morning, I think I found out the problem…..
One of my mixed matches of birds, a pair I put together when one didn’t get along with anybody else, was broken when Pipsqueak, my last lovebird, died. 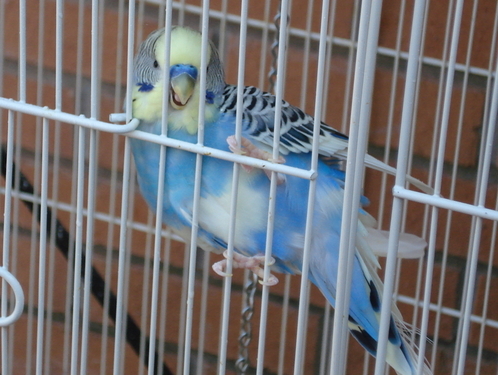 Pipsqueak’s widow, a parakeet named Shelly, has decided she loves Beady. Well, the problem is that Beady is married to Gumby. Gumby has taken Shelly moving in on Beady for too long, she says, and has started trying to right this wrong. So, this morning, I put Gumby, the instigator, and her husband, Beady in a house next door to the rest of the parakeets. Shelly will have to admire Beady from afar. Calling parakeets “married” might sound funny, but in the parrot world, that’s the way it is. Parrot-type birds all mate for life. Beady is in love with Gumby now, but actually, he has been a widower a couple of times. Beady’s first love was a one-legged parakeet I talked the manager of PetSmart out of. I try not to pay for handicapped birds – I just promise to take care of them for life, and I do. Miss Piggy (who I named after the joke about the pig so good the farmer couldn’t eat all at one time) was alone in a cage at PetSmart, on the floor in the corner, since they didn’t know what to do with her. Beady loved Miss Piggy, and would bring her food since she couldn’t get around very well. They were a very sweet couple. 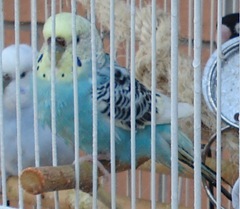 When Miss Piggy died, my old spinster parakeet named Ziggy moved in on him. They were together happily until she died a few years later. But, Beady loves love, and now he is with Gumby. And, as I found out this morning, Gumby is fiercely protecting her marriage with Beady against the pretty widow, Shelly. So, now all is calm in the parakeet houses again. Whew. I can stop coming in in the middle of the night to break up fights.